We’re back for another installment of The League of Extraordinary Bloggers! 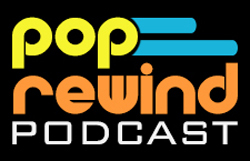 This week Lee and Linz discuss childhood favorites. 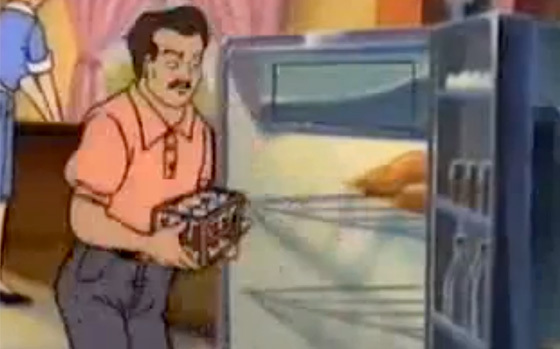 When I was a kid, my favorite anti-drug video was Cartoon All-Stars to the Rescue. My mom worked weekends at her friend’s video rental store in the early 90s. (For those of you not familiar with the concept of a video store, it was this place in which you could temporarily borrow movies on tape for a fee.) Usually, that meant I got roped in to going with her for an entire Saturday. Such a sacrifice meant not sleeping in, missing all the cartoons, and not spending time with friends. But, hey, I did what I could to support family. It was pretty rare I could cash in on any kind of free rentals. Honestly, that’s probably for the best considering their video game library consisted of five NES games and one of them was Dr. Jekyll and Mr. Hyde. Occasionally, I would take a tape off the shelf and watch it in the back room. There were only so many times you could watch Rude Dog and Bananaman, though, so I scoured around for something I hadn’t seen before. That’s when I landed on Cartoon All-Stars to the Rescue. Seeing the “who’s who” of every cartoon at the time on the cover of one VHS box was more than a little mind blowing. How had I never heard of it before? Needless to say, Cartoon All-Stars became my go-to video to watch on Saturdays at the store. In response to angry letters, the second Cartoon All-Stars special focused on the importance of telling the truth. 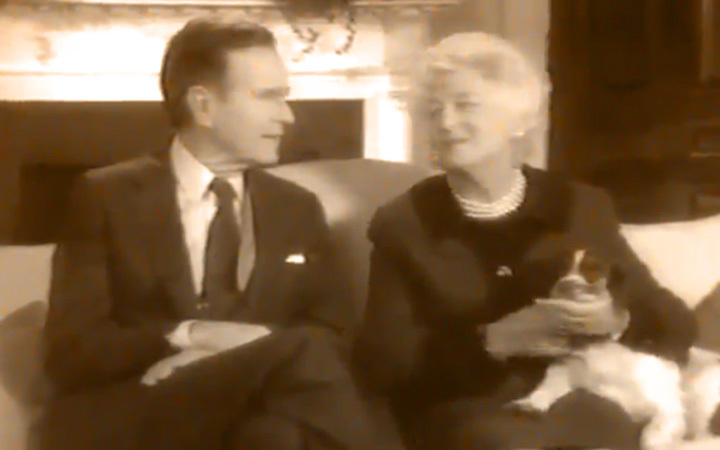 George and Barbara Bush introduce the cartoon, while their dog is being uncomfortably handled. It features musical numbers with Ducktales and Muppet Babies characters describing alternate ways to say “no” to drugs. Alf and Michaelangelo show up for a good time. Bugs talks to second hand smoke. Slimer serves as a great example of the effects of mind altering substances. The Chipmunks have a serious discussion about marijuana. Oh, and Garfield is a lamp. Anyone who didn’t partake before watching this tape certainly walked away with a trippy experience just the same. When the video store inevitably went out of business, I somehow acquired the tape. Over the years, my ownership of it became legendary. Friends and sometimes friends of friends would show up wanting to see a cartoon character drink beer. Even in college (before YouTube), word on the street was I had this video. I can only imagine what strange memories people have of spending time at my house, growing up. 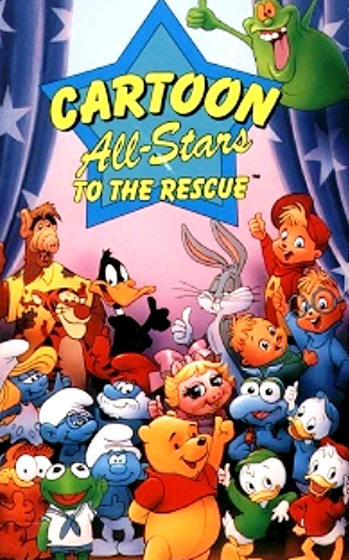 Today, Cartoon All-Stars to the Rescue is a pretty big joke on the Internet, but back in the 90s it was one of the best kept secrets in pop culture. For what it’s worth, the message apparently worked on me. I guess I’ve never wanted the Chipmunks to show up at my house, rifling through shoe boxes. As for me, Linz, one thing about me as a child that still holds true today—when I get obsessed with a movie or TV show, I watch nothing but that movie or TV show. Currently it’s The Nanny and season one of Bob’s Burgers (only because the rest of the episodes aren’t out on DVD yet). 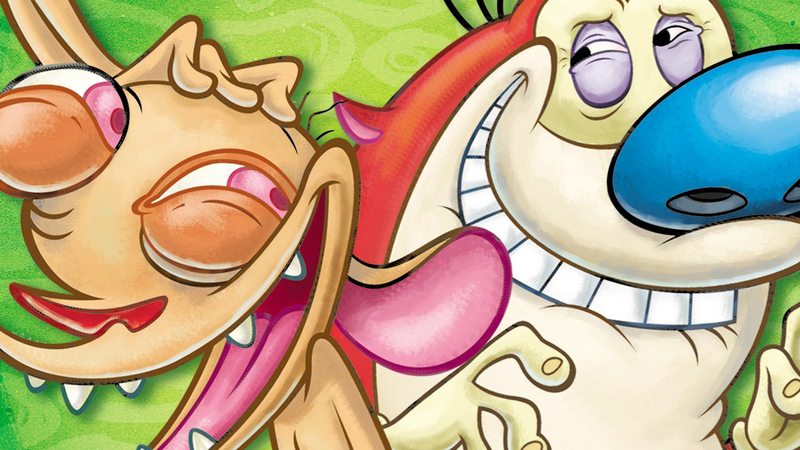 When I was a kid, my favorite cartoon series was Ren & Stimpy. Svën Höek was by far my favorite episode. I’m a sucker for the over-the-top ridiculous episodes that don’t advance the show in any way. 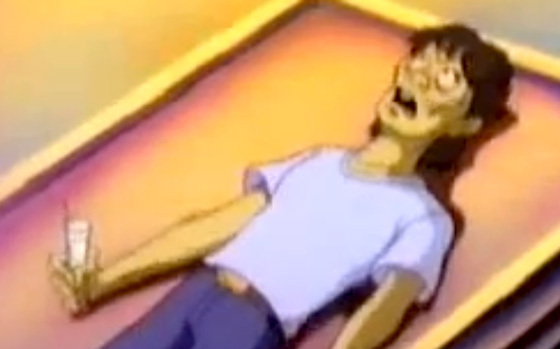 I also enjoy characters that are even more ridiculous than the main characters. And I may have considered starting a ball of band-aids, but didn’t end up hurting myself quite enough to get the volume of used band-aids that I’d required. During the original run on MuchMusic (Canada’s MTV), I was too young to realize all the drama with John K. and Nickelodeon, but I watched the hell out of those episodes. 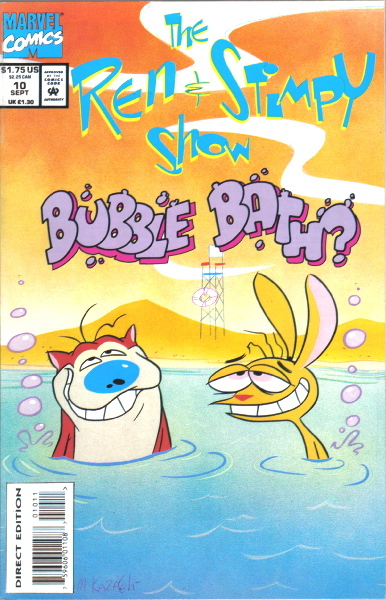 In 1993, the CRTC (Canadian Radio-television and Telecommunications Commission) deemed Ren & Stimpy too vulgar to air on MuchMusic, so to say goodbye, and stick it to the CRTC I’m sure, they ran an all-day Ren & Stimpy marathon that I had my dad tape for me—a tape I still have, even though it’s very worn from a decade of solid use. To go beyond the series, I had all the merchandise I could get my hands on (that my parents would pay for). The “under-leg noise making” dolls, buttons, posters, VHS tapes (which have since been upgraded to DVDs), albums, PVC figures, T-shirts, magnets, candy, video games, trading cards, every issue of the comic book series, and I’m certain there’s more. Speaking of the comics, I had written to Dr. Stupid, but never received an answer. I was heartbroken, but I must have gotten over it because I don’t remember what my question was. The comics were a big part of my childhood and I remember getting in trouble a lot in the sixth grade because I would always bring in my comics, but I’d never remember to do my homework. Oops. I drew and traced from those comics constantly, particularly the Bubble Bath issue. I still have Christmas tree decorations of Ren and Stimpy in the bubble bath that go on my tree every year. In 1995, the Internet started being a thing that you could use your home PC with Windows 3.1 to access. We didn’t get the Internet at home until 1996, but in 1995 my dad’s friend Brian had the Internet at his house. 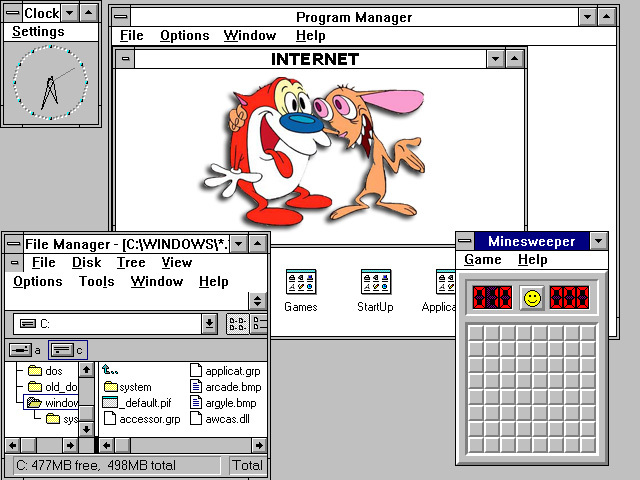 We went over one day and the very first thing I ever looked up on the Internet was Ren & Stimpy. I printed out the FAQ (remember those things?) and obsessed over that for a while. My best friend and I even started a “Ren and Stimpy Club” probably because we had no friends and thought this would be a good way to get some (note: we still have no friends). We did up little membership packages and had nametags like these other fifth graders were joining a Chamber of Commerce. In sixth grade, we dressed up as Ren and Stimpy for Hallowe’en. I’m not sure if I’m sad or thankful that no photos of this exist. Shaven Yak Day is a holiday that may have been celebrated by me at one point. We quoted that show every chance we got. Years later, I got my little cousin hooked on Ren & Stimpy, something that probably didn’t translate well to the other kids in her school since this was 2004, but she turned out just fine. We’ll see what other impressionable youths get addicted to the show at my hands. Achievements in Gaming loved his bike! Goodwill Hunting 4 Geeks has a handful of mini-figures close to his heart. Tupa’s Treasures has an awesome post about a vintage Winnie the Pooh plush. I’ve never seen all of the All Star special but always wanted to. I thought that was the coolest thing to get all these characters together in one cartoon!! tupa01 Definitely worth checking out! And thanks for the comment & link!